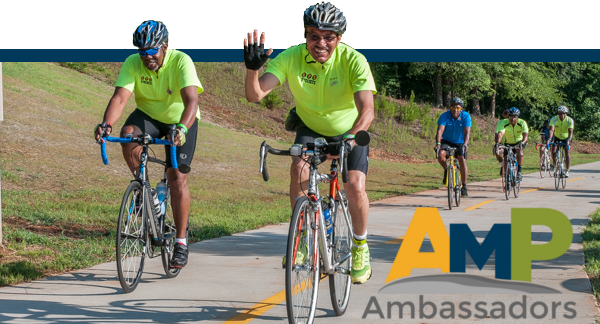 Be a friendly face along the The Arabia Mountain PATH as an AMP Ambassador! The Arabia Mountain PATH is the best trail system in Georgia! With over 30 miles of paved trail, 21 vistas and landmarks, and connections to 10 miles of soft trails it is easy to see why. Now you can enjoy this trail system while supporting it! The AMP Ambassador program is made up of volunteers who greet other trail users, report any maintenance issues, and make the trail safer just by being there. If you like to walk, jog, or ride your bike along the AMP we would love to have you join this new volunteer opportunity. Who can join the AMP Ambassadors? Anyone who can use the trail at least once per month can apply to join the program. Where and when does an AMP Ambassador volunteer? You can visit any portion of the AMP that you like at any time from dawn to dusk. We encourage Ambassadors to explore new area of the trail but you can use any section that you wish. What are the responsibilities of an AMP Ambassador? The two main roles of an Ambassador are to act as a friendly face to other trail users and report any safety or maintenance issues along the AMP. How do I learn more or sign up? All AMP Ambassadors start by speaking with us. You can send an email or call 404.998.8384.